In the rush up to the Christmas holiday and with my often crazy work schedule I have to make a date to distribute all the homemade gifts I've prepared. Today the 10-year-old and I pulled our red wagon loaded with jars and strolled the neighborhood. We managed to get all but 6 delivered out of 21 names. It was nice to see everyone, and chat a bit, and hear about everyone's holiday plans! Tomorrow I will bring gifts for my riding partners and instructor and at some point the kids will take some to their teachers. I have gift cards for the mailman and the sanitation crew. Thursday I will deliver 24 jars and 6 dozen cookies to work and spread some holiday cheer to the staff. Oh, yeah. And gum. I bought LOTS of gum. The ER staff really likes gum. It might even be better than chocolate. My holiday gift list gets larger every year. This is a good thing, of course. But I find that I have to work hard to expand my gift stash to get ready for the latter part of the December. 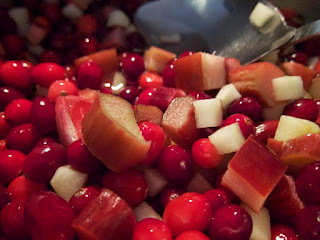 I was thinking about the pear almond compote I made several years ago, and then I thought about adding cranberries and, well, I didn't have pears but I did have rhubarb, and then I thought, what are you waiting for? This scaled-up version made 11 cups of compote, enough for 9 half-pint jars, 3 half-cup jars, and some for me. It's nice and tart, not very sweet, but sweet enough. I am guessing a little bit on the processing part but based upon similar recipes in my books, have decided upon 15 minutes in the boiling water canner and let them rest for 5 minutes before removing them. I'm sure that will be more than enough. This makes 33 jars in my stash and I need at least 8 more. Maybe I'll make another batch!